Precious metals expert Michael Ballanger discusses distortions in the markets. Here is a question for any and all of you that have ever purchased a lottery ticket or played the slots or bet on a horse: If you had proof that the outcomes were all rigged, would you still play? If someone showed you a video of pit bosses stacking decks or tampering with dice, would you ever enter that establishment again? If your wife or mother or employer knew that you would constantly blow your paychecks in a rigged casino, would you ever be able to face them? The answer to all of the above-mentioned scenarios is a resounding "NO!" Yet millions of people (albeit that figure is rapidly shrinking) are still committing many hundreds of millions of dollars every week to the Crimex Casino, which has now proven that every single input into determining prices for gold and silver (Bitcoin, too) is completely controlled by the bullion banks, the Crimex bosses and the regulators. The Transitive Quality of Equality states that "if a = b and b = c, then a = c." The Transitive Quality of Gold Pricing is "if I buy gold based upon demand and supply, and demand and supply have no bearing upon price, then I am buying gold with no concern for price," which is total insanity. We have seen in the past 30 years how the Crimex banks are able to use the paper markets to influence not only near-term demand but also long-term supply. By suppressing price, they are now influencing supply with no better confirmation than the paucity of new BIG gold discoveries since the 1990s. The price managers in New York and Washington and London and Brussels and Tokyo and Beijing seem to all agree that citizens of all nations should be urged to avoid gold and trust paper currencies because of national security issues. The truth is that the paper merchants cannot charge a fee if your net worth is held in physical metal. Now that they control the Four Pillars of Commerce—banking, investments, insurance, and real estate—the big banks view gold and silver in a totally hostile view because these alternatives threaten to dissipate their power of monetary control, and if there is ANYTHING that will send a banker into a murderous rage, it is the mere THOUGHT of losing control of the "flow" of money, which they currently command and in spades. As a young student in the 1970s, I listened to the Jesuit Fathers teaching us about "sound money" and "fiscal jurisprudence" and "inflationary spirals" and what was indelibly etched upon my early-adult psyche was that "Cash is Trash" in periods of government largesse and mismanagement. They would abandon the prescribed curriculum in favor of open debate on numerous occasions because in the 1970s a powerful new voting (and consuming) block of citizens known as the "Baby Boomers" was rapidly assuming power and influence to the extent that they were able to halt the war in Vietnam and change abortion laws, to name just a few. In that period prior to computer-assisted and software-managed trading, humans made ALL of the investment decisions irrespective of term. Decisions to hold for the long term or scalp a point or two were made by individuals and the only technology made available to them was (perhaps) a hand-held calculator or, in some cases, a slide rule. So when the inputs in 1971 involved then-President Nixon abandoning the gold standard, what he really did was make it impossible to convert U.S. dollars into gold, which is what President De Gaulle of France had ordered his treasury department to do as U.S. Treasury bonds matured and repayment was required. Rising gasoline prices due to Middle East embargos and domestic political chaos (Watergate) forced investors to shun traditional investments such as stocks and bonds because rising inflation brought on by the credit creation from wars and budget deficits was eating away at returns. Investors chose sound money—gold and silver—and those who acted in 1971 at US$35 per ounce were handsomely rewarded; the natural flow of human interaction allowed gold's popularity to gradually increase over the balance of the decade rising to $857 per ounce before the U.S. Fed woke up and decided that gold was an Enemy of the State, covertly at first and then suddenly. Compared to the inputs of the 1970s, those that we track from the post-2008 Financial Crisis make war expenditures from WWI, WWII, Korea, and Vietnam pale by comparison. The costs of two world wars and the Asian wars were measured in billions of dollars while credit creation since '08 implemented to save the American banking establishment is being measured in the TRILLIONS. However, since humans making investment decisions in the 1970s could not be programmed, gold and silver could not be controlled as they are today. Here in 2018, the inputs that should have driven gold and silver to new highs are numerous and powerful, but the controls put in place by the global elite are even more numerous and infinitely more powerful. Just as Baron Rothschild said the year before the establishment of the First Bank of the United States in 1701, "Let us control the money of a country, and we care not who makes its laws." Paul Volker made sure that in the 1980s and beyond that the government would never again attempt to manage a financial crisis without first managing gold. Since gold ownership by U.S. citizens undermines the very essence of banking, gold ownership has been discouraged for the past nigh-on forty years. And it is NOT about to change. Another reason that the Western world today takes such a dim view of gold ownership is that the two most voracious accumulators of gold in the world are the two countries most at odds with America—Russia and China. Russia alone bought 224 tonnes of gold in 2017 from the proceeds of the sale of U.S. treasuries. Now we have the U.S. entering into trade wars with China and quietly tweaking the nose of the Big Russian Bear as they ramp up gold ownership and ramp down dollar holdings, which was exactly what was happening in the 1970s and which resulted in a crash in the convertibility power of dollars to gold. As a means of managing the crisis, those who control markets decided to do away with highly volatile humans in the implementation of financial market "policy" and instead replace them with machines that could be programmed with responses to external event-driven stimuli easily controlled. In this manner, the new generation of investors do not react to the ringing of the Pavlovian dinner bell of rising inflation and domestic turmoil with gold purchases; they observe the past 10 years of gold performance versus stock, versus real estate, versus pot stocks, versus cryptocurrencies and simply jettison cash in favor of something—ANYTHING—not in the crosshairs of the central bank bazookas. Once you have achieved the stark and brutal meaning of this cartoon, you will have gleaned the meaning and intent of this missive. As Einstein's definition of insanity continues to swirl in the minds of gold and silver investors around the world, why exactly is it that men of education, experience and success like Eric Sprott continue to wager considerable portions of their net worth into the gold market by way of physical gold and silver, shares and, most importantly, personal credibility? What is Eric Sprott seeing that his fellow gold investors are not? 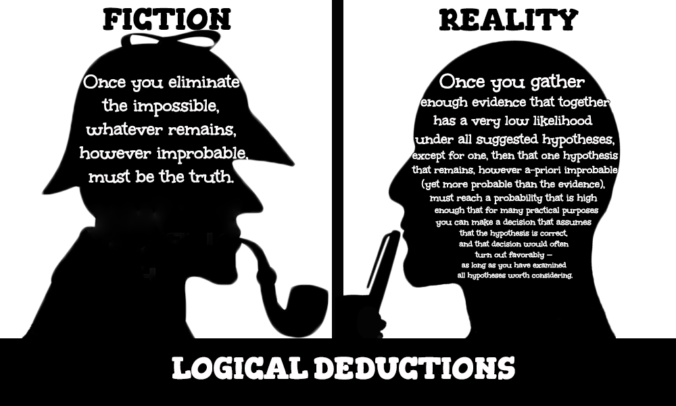 Sherlock Holmes says in the cartoon seen above everything that I said in 2008, that is, it was impossible for a collapse in real estate prices to NOT vaporize the banks and when it was proven that it didn't because the criminals stepped in and saved their banking brethren, whatever remained was a truth of another feather, a mist of reality, a misconception. The reality of the moment was that logic did NOT dictate and since unnatural results were cogenerated by faulty assumptions such that as happened in 2009 and beyond, the gold market suffered despite massively bullish inputs and the stock markets thrived despite equally bearish inputs and what we are left with is a total mistrust of the exercise of analysis and fundamental and historical valuation techniques. An anecdote upon which to ponder: in the early summer of 2017, excited as I was on the possibility of a major light-up of the Nevada mining scene, I recommended Stakeholder Gold Corp. (SRC:TSX.V) for its then-recently-acquired Goldstorm property in Nevada located at the convergence zone of three major gold-bearing trends (Getchell, Northern Nevada Rift and the "mighty" Carlin) and adjacent to Seabridge Gold's Snowstorm Project. In May of this year, I started calling upon friends and allies who typically might invest up to $2–5 million (collectively) in deals that I might introduce. Result? Zero interest. I usually avoid deals that have a heavy "lift" factor so with only 21 million shares issued, I was astonished at the response so I called all of them back and asked why they were passing. To a man, they all said the same thing: "We have enough gold juniors." By contrast, two weeks later, I called the same group with an offering that I had assisted back in 2016 that has a presence in the VANADIUM (think "battery metal") market and they bought 25% of the financing within 10 days. What does that tell you about the current state of the precious metals market? I am the most contrary of all "contrarian investors" that you will ever encounter. I was laughing at CNBC in 1999 and shorting the NASDAQ the second that PETS.COM went "offered" below its IPO price of $11 per share, and I was shrieking wildly when AOL bought Time Warner based on the currency value of its paper. I was likewise in stitches when in 2009 when Barrick Gold announced intentions to reverse its hedge book with gold up $800/oz from the lows of 2001 where they were sellers. However, NOTHING compares to the bubble in which we all reside relative to the FANGS. Having said that, they are all protected by TPTB because they are symbols of largess and resignation in the world of the bankers. "Just keep the masses happy!" shouts the banker to the mayor. And that, my friends, is where the illogic of financial analysis lays its illustrious hat. If the young child that watches the Emperor march down the street in his undergarments fails to shout, then the magnificent cloak upon which his vanity struts remains vibrant and alive; if the child screams in terror at the sight of bare flesh, the cloak disappears. 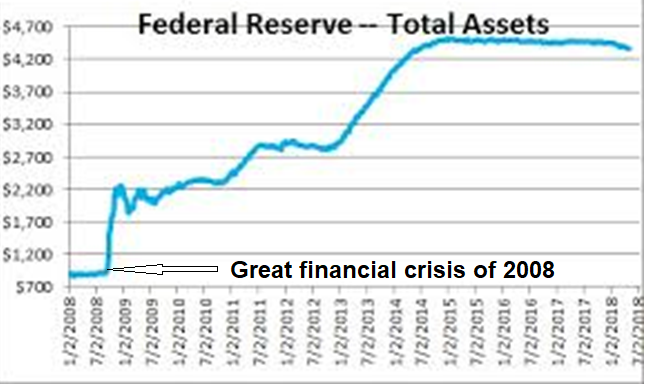 The global arena is absolutely filled with a miasma of choking debt and currency debasement. It is like watching the masses in pre-revolution France, reaching out with starving hands as Louis XIV passes by, unabashed corpulence abounding. The canaries in the coal mine for Western economies used to be the bond market—rising yields meant certain doom—so governments "in the loop" conspire to put out fires where required (Japan, Switzerland, Greece, Italy, etc.) but today the canary is your local domestic stock market's index, be it the Toronto Stock Exchange 300 or the FTSE or the ASX. Investors have found a new retirement fund in stocks by way of never having to worry about losing a dime in the market. The old expression taught to me by my late-grandmother was "Buy land, Michael. It will always save you in the end." (She was SOOOO right.) Today, the new safety is the paper solidity of the stock market and as all of my contemporaries move on to that great trading pit in the sky, I simply sit back and shake my head at the prospective outcome of so much fraud ingrained into the financial system and how it will ultimately play out. The historical roles of gold and silver have proven exemplary in countries like Venezuela, Turkey, Argentina, and Zimbabwe, but they have little meaning nor utility in countries anchored by the U.S. dollar. While I have no doubt that such conditions will change, identifying the precise time point has been, shall we say, "elusive" (at best) verging upon "impossible" (at worst) because it requires a knowledge of the welfare and intent of the "invisible hand" that controls financial markets through intervention and regulatory glaucoma. The last two purchases I have made were Western Uranium and Vanadium Corp. (WUC:CSE; WSTRF:OTCQX) at C$0.68 and Aben Resources Ltd. (ABN:TSX.V; ABNAF:OTCQB) at $0.37, both acquired in August. The former is up 251% while the latter is down 43%. In the case of ABN, results reported on Tuesday included 12m of 5.08 g/t Au with 27 holes pending. I added an equal amount at $0.20 so my new adjusted cost is $0.285. As I mentioned a month ago, the Golden Triangle of B.C. is "elephant country" and these results did not warrant the mass exodus that is so typical of the kind of junior mining markets we are forced to deal with. Western Uranium and Vanadium's performance is no surprise as vanadium continues to scream ahead having touched US$21.40 this week. It is instructive to remember that when the company raised money in 2016 at C$1.70, V was trading around $3 and U was at $22 and at the time, WUC was valued at around one-third of valuations enjoyed by its peers in terms of market cap per pound. With the big price rises, the in situ metal value has risen from $2.475 billion a month ago to $2.8 billion as of yesterday's closing prices, which explains the 52-week print at $2.44. I am moving my limit price for new positions from US$1.50 to $2.00 based on the positive outlook for uranium and will add accordingly. 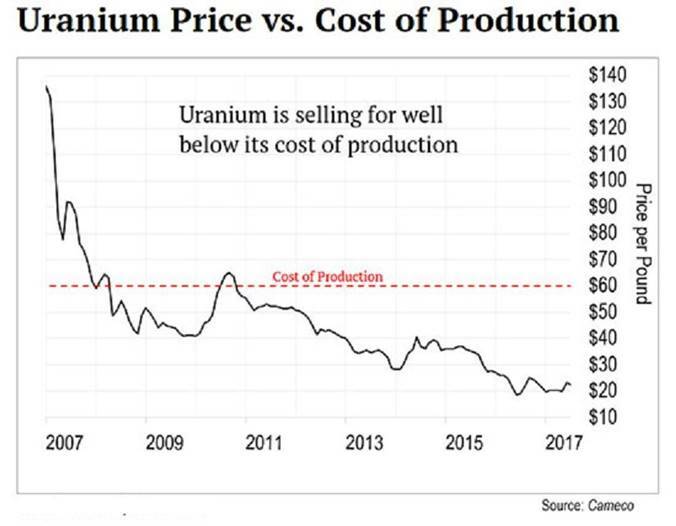 When the uranium stocks move, they move BIG and the following charts shows why. I long for the days of free markets where governments avoided market commentary and where central bankers focused on the loan portfolios of the member banks as opposed to market reactions to their "prepared remarks." I long for the times when exploration plays had a life span longer than one day and where solid results were bought rather than sold. Finally, I seek a return to the days of yore when logic prevailed and money ebbed and flowed with a natural grace and order without the irritation and malevolence of algorithm-guided software. This is not a return to the Dark Ages; it is a return to market normality.